Thanks for taking time to look at this project. Here is a posting with an index at the end. The index will lead you to various techniques used to build boxes. A special thanks to all of you who take time to write comments or ask questions. Your responses are what make these postings fun to do. Pictured is an urn (L 10” x H 6” x W 6 1/2”) The top and corner splines are made from a Movingui tree that grew in Ghana, Africa. The Black Cherry sides are made from a tree that grew on our property in Southern Indiana. 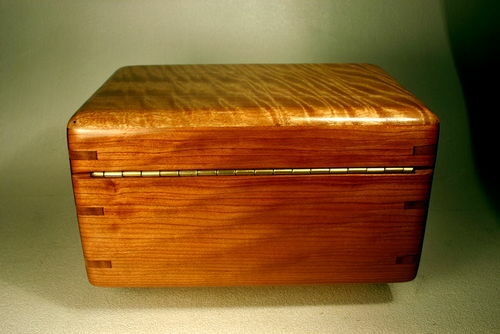 Story: If you make boxes long enough someone is going to ask you to make an urn. I don’t market urns, but I have made some for friends. So lets talk about doing that. The first thing to know is that various funeral homes handle cremains in various ways. Some come in a plastic sort of box. Some come in plastic bags. There are some that come in a cardboard carton. You need to know how the ashes are packaged before you make the urn. 11 x 7 x 7 is a pretty minimal size. As a very practical consideration, a larger person may need a larger urn. If at all possible, I would make a trip to the funeral home and find out what type of container they use for cremains. 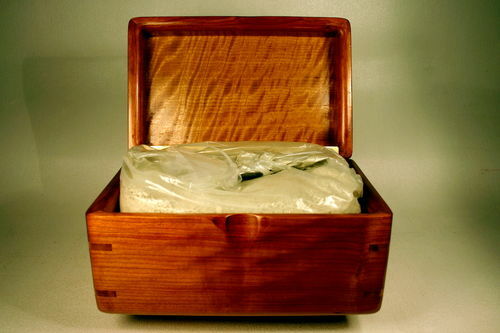 To be quite candid, cremains are really heavy and usually textured much like kitty litter or oil-absorbing limestone. If they come in a bag they may need some manipulation to fit into a wooden box. You can’t just pour them into a wooden box because the ashes will combine with moisture from the air and turn into a caustic lye-like mixture that will destroy wood. You will need a sealed plastic or ceramic liner to prevent this. Urns need to be strongly built and If there are young children around, I would recommend the lid be screwed onto the box. The design I prefer doesn’t have a hinged lid; but rather, uses a screwed-on removable bottom board. 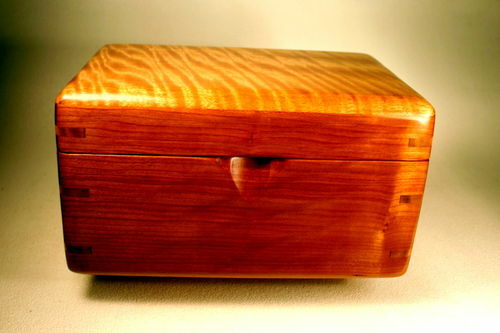 If the family wishes to scatter the ashes then a hinged lid makes that easier. I usually ask the family if I can go to the funeral home and pick up the ashes for them and place them in the urn. It is a task most relatives don’t relish and funeral homes are comfortable keeping ashes for a while until they are claimed. So you will have some time to make the urn. Of course, you will need to get the family’s permission to claim the cremains and the funeral home may want to see some ID before releasing them to you. 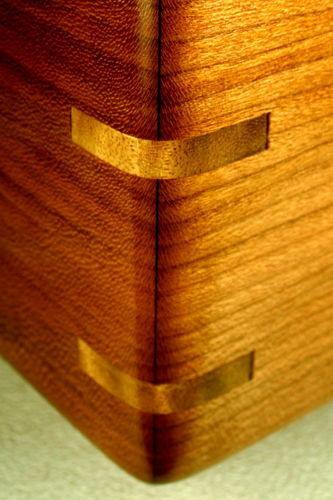 For me, making an urn for a friend is a very personal and solemn task. I give it a good deal of thought before I start and try my best to create something that I think celebrates and reflects the person I knew and will miss. Very nice Urn, Job well done. Thanks for all the information you gave, very informative. Beautiful box, Al. 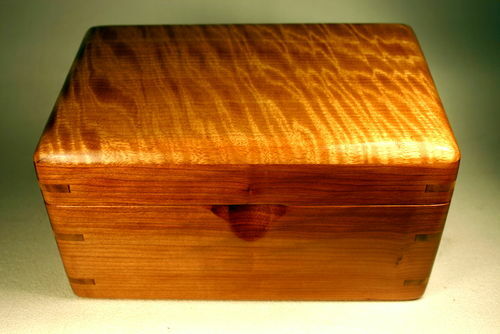 The cross-grain in the lid really show off the wood well. I, too, have done a few urn boxes, and I was told by the funeral home guy, that the standard is 230 cubic inches of volume is the standard. The first ones I made had a hinged lid that needed to be screwed shut, but the more recent ones have a bottom panel set into a dado and attached with screws. I even had one family that wanted 3 smaller boxes, all the same, so they could each take a portion of the ashes with them. That is a very fine urn. The only thing I don’t lik is the brass hinge. I would rather have a wooden one. As the others says thanks for all the good information about making boxes. Very nice job Al. You have done your friend proud with a box nobody hopes to ever have to make. Thanks for the info also. Great information. I’ve been asked, but it’ll be awhile before I make one. Al, this is a beautiful urn. I love the wonderful wood and also the fine details and craftsmanship. I build a burial urn for my FIL, the veterans cemetery have me exact dimensions of the ash box without even a second glance. I guess it is a common request. Al, another nice one and excellent advice. The wood contrast is outstanding. I built an urn on commission a few months back that was a little different. I didn’t know it as the time, as the buyer provided all of the dimensions, but it was for a child. The part that made it different is that they wanted a hand cranked music box that played Led Zepplin’s Stairway to Heaven installed in the box. It was larger that usual in that they wanted to put the existing urn inside and that it was to be made entirely from Red Oak. Wood contrast was lacking, but the customer was happy. Here is a Link if you want to take a look. Al, Great post! When I thought about urns such as the one you made I Googled it Pricing is an interesting point but usually not discussed in times of grief. First thanks to all for your comments and looks. I am looking forward to others and will reply to them as well; now that I am back home from church. Oldrivers, I hope the information I have posted will be helpful to you, should you need it. Clarkey, you’re welcome. Glad I can help. John, figured movingui is a rarely beautiful wood. The actual grain of the wood runs side to side on the box. The curl runs front to back. It is much like Satinwood. Knappen, wooden hinges are great and attractive, but on something expected to last a lifetime, I prefer steel. However, I get your point. Jeff, you are right. Nobody expects to make an urn for a friend. Scott, you never know when you are going to get an urn request you simply can’t refuse. Charles, you are correct. Both the cherry and the movingui are beautifully figured and have amazing grain. 230 cubic inches of volume sounds a bit small. This box is twice that. However, remember that the volume will vary from person to person. Redoak49, thanks for the kind words. Splinter, all of the funeral homes in this area have been very cooperative as well. Bob, I did look at the link you provided. Nice work. Thanks for that. I should think that the “Stairway to Heaven” music works would be difficult to find. Doc, always nice to hear from you again. I did some welding this week. There is money to be made if you are making urns for sale. It is just a task I don’t like doing…except when asked by special friends. A beautiful urn Al, I love that movingui. ive had the unpleasant need to make a few myself,some for immediate use and some for the future.while not the most favorite things to make each has brought some comfort and great thanks from the recipients.you did a nice job on this one and I think everyone really appreciates the time you spent detailing the build process,thank you very much al.